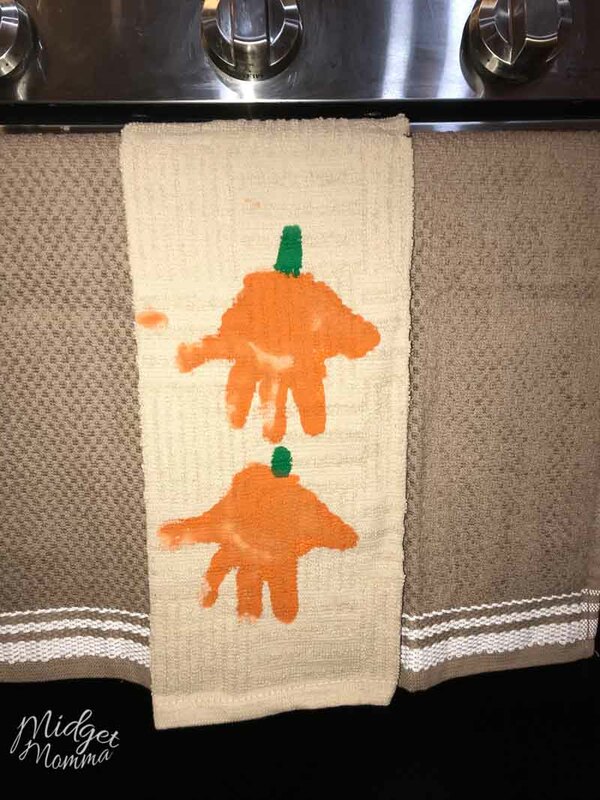 If you are looking for a super cute pumpkin handprint craft then you are going to LOVE these pumpkin handprint towels. 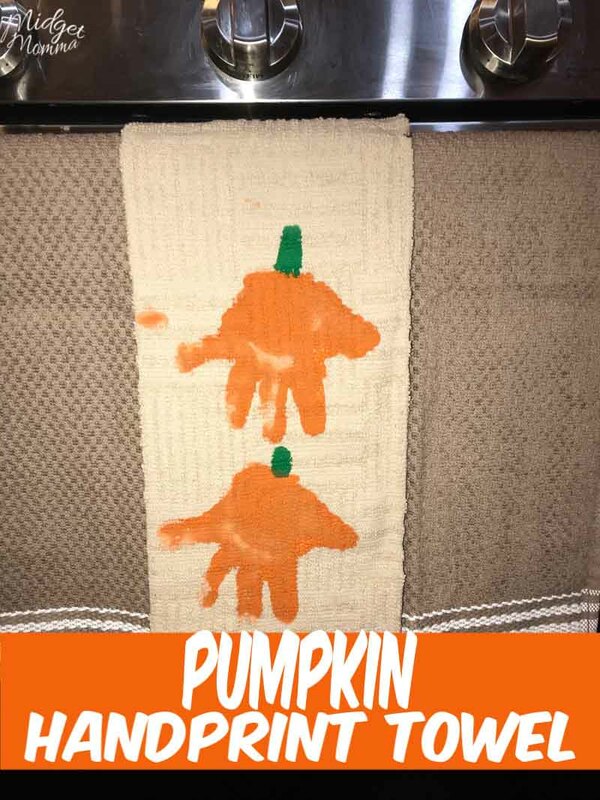 Turn your kids handprints in to adorable pumpkins with this Pumpkin Handprint Towels craft! I love making Halloween handprint art with the kids, and I love making homemade handprint crafts that we can also use as decorations. 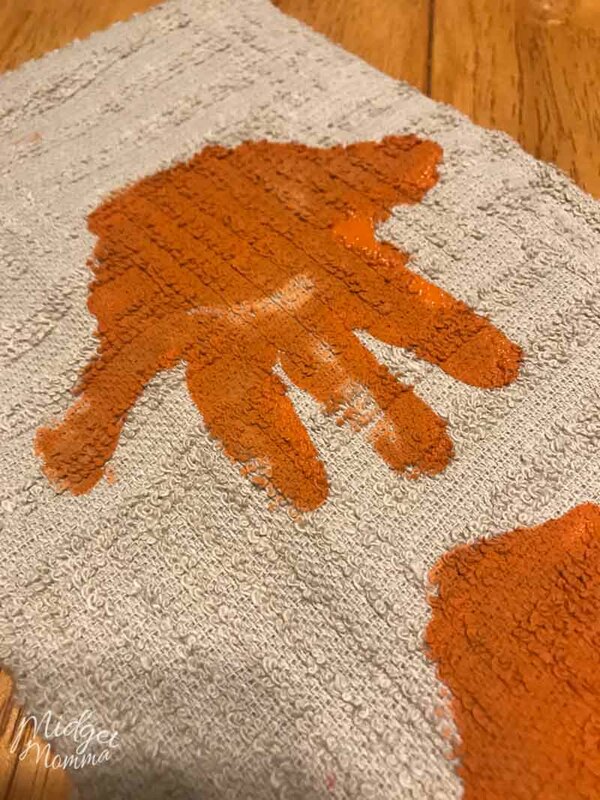 This handprint pumpkin towel is the perfect kids halloween craft that can also be used as a decoration in your home. 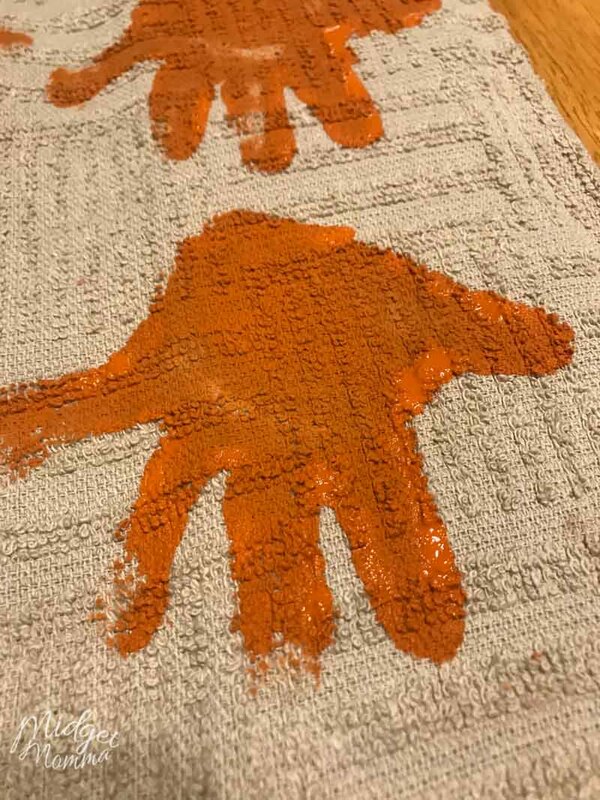 Making these Pumpkin Handprint Towels is super easy! All you need is a tea towel or a kitchen towel, some paint and your kids! When making these pumpkin handprint towels I highly suggest having a container of baby wipes at the table with you. You are going to get messy kiddos with this fun halloween craft, but it is totally worth it! Having baby wipes on hand makes it so you are able to wipe off the paint from their little hands before they leave the table. They won’t make them perfectly clean but it will make it so you avoid painted handprints on your wall while they walk to the bathroom to finish cleaning up their hands! If you are looking for pumpkin crafts for preschoolers or pumpkin crafts for toddlers, this is a great one! I made this one with my 2 year old and she loved it! White or tan teatowel – we went with tan as I liked the look of the orange pain on it. Take your paper plate and squirt the orange paint on it. Fold you towel how you want it to be when you hang it on the stove bar, and then turn it upside down. You want the hand prints to be going in the opposite direction of how you want it to hang because it is much easier then turning a kids hand in different directions. 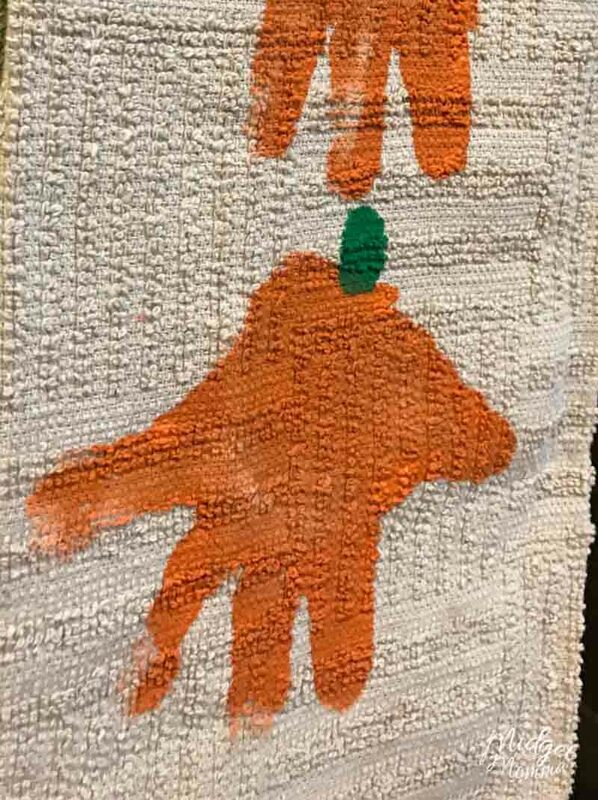 With your foam brush paint your child’s hand with the orange paint or you can let them stick their full hand into it. Depending on how old your kiddo is do which ever one works for you. Then press their hand on the towel. Do this for each pumpkin you want on the towel. We did 2 pumpkins, but depending on the size of your kids hand you will want to put 1-3 handprint pumpkins on the towel. If you want to make the orange brighter, after your kids have done their handprints you can go over the pumpkin handprint with more orange paint. Using your thin paint brush and green paint, paint the pumpkin stem at the top. If you want to add the date to the bottom of the towel, use the thin black paint brush to put the date on the bottom. Allow the paint to completely dry before use. Follow the directions on your fabric paint when washing your towels. Looking for more Handprint crafts? Check these out! Looking for more Fall and Halloween Crafts? Check these out! 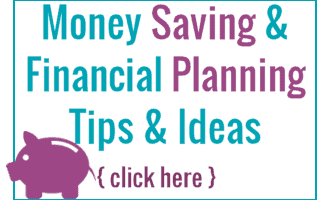 Subscribe to get our latest crafts and kids fun activities via e-mail!